Ellen Schreiber Pens First Manga for TOKYOPOP and HarperCollins! Thomas Mulcair MP for Outremont, a rich suburb in the middle of Montreal has won the leadership of the socialist New Democratic Party of Canada (NDP). Their late leader Jack Layton died in August 2011 of cancer after overtaking the Liberal Party of Canada as the Official Opposition in the House of Commons in the May 2, 2011 federal election in Canada. I didn’t like Jack Layton then nor the NDP and neither do I like Thomas Mulcair today. I don’t like the ruling Conservatives either. I’m disenchanted with the Liberals. I’m not happy about the state of Canadian politics and who represents Canadians right now. Since I could vote, I have always done so and encouraged friends and family members who didn’t care about voting to do so. I’ll probably go to the ballot box in three or four years, but only to spoil my vote. Thomas Mulcair is an exact replica of Stephen Harper. Harper likes to divide and antagonize Canadians. His supporters like to play us versus you games. They are self-righteous and cannot admit any flaws. They have plenty. 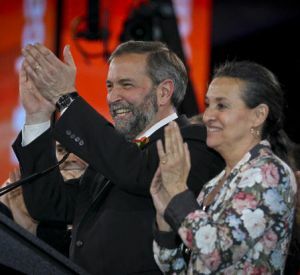 The NDP, by electing Thomas Mulcair has given Harper his left-wing doppelganger. That’s a poor reflection of Canada that in order to fight one wrong, you need an antidote as bad. When I lived in Quebec, I followed Mulcair’s career. He was a hothead who quit the provincial Liberals making a lot of noise and drama. Mulcair is a drama queen. I don’t like drama queens. The gentrified, rich and privilege voters in Outremont voted for Mulcair. People in Outremont are like people in Greenwich Village. They can afford to vote for a socialist because it’s the trendy thing to do. It has nothing to do with deep beliefs in the socialist discourse of the NDP. But it’s as hip as waving an iPad at a bistro, sitting at an outdoor table and ordering a fougasse with some foie gras on the side. It’s what people in Outremont do. It has nothing to do with showing solidarity with the downtrodden workers and chronically displaced immigrants of Hochela-Maisonneuve. I’m a former Montrealer. I know about how the clique in Outremont thinks and act and dictate the flavour of the day for the rest of the province of Quebec. I find that aspect of Quebec culture nauseating and I’m glad I left Quebec many years ago for Alberta. If you can go to Tout le monde en parle, a popular talk show, quote the auteur du jour, share a good recipe and crack a few jokes in French, the elites of Quebec will like you and bestow upon you, if you are an Anglophone as Layton and Mulcair, an honorary French Québécois status. They’ll love you. And the sheep all over the province will too. That’s how the so-called Orange wave began. That’s partly how the NDP achieved its historic Official Opposition status in the last election. But the NDP is becoming rowdy. They think they’ve got it made. They’ve been gunning for years for the Liberals to overtake them as the government in waiting party. They do have better advertising, better campaigns, and are far more aggressive. As for the Greens which they say they like, the NDP’s program was built to support unionized workers and big polluting industries. It wasn’t built to support sustainable development. I was exchanging tweets earlier with one of those neo-democrats that were happy to finally smell the scent of power. I told him that the problem with the NDP is that they assume they can overtake the center which is occupied by the Greens and the Liberals, convert voters into neo-democrats so they can take on Harper’s conservatives. There is the new term that was coined called the “progressive parties.” That’s anyone who is not a conservative in Canada. If you’re not on the right, they say you must be on the left. That ignores the place where most Canadians actually sit which is the center. I’m dead in the center myself. I don’t care for unions and the socialist agenda for equality of results of the NDP. I don’t care for the social conservative agenda of the conservatives. I care mostly about competition and meritocracies. Neither the conservatives nor the neo-democrats believe in competition and meritocracy. They have to rig the game. They have to impose their beliefs, their theology and philosophy on the rest of us. But Canada is an ever changing country with a diverse population built on the premise of two equal founding people. I want pragmatism and rule of laws, procedures that turn a blind eye on your ethnicity, your religion, your gender, your age and your social status. Neither the NDP nor the conservatives believe in that. The NDP want to stick it to the man while the conservatives want to make sure the man can never stick it to them. Most Canadians have more pressing issues than ideologies. Most Canadians are in the center. Conservatives have figured that out a while back and toned down and tried repeatedly to appeal to the center. With Mulcair, neo-democrats are about to do the same. Yet, each believes that once the center has been caught, that they can drag it over to their side and make them see the errors of their ways. That neo-democrat I was tweeting with earlier said something like that. He tweeted to me that the centrists are wishy washy and can’t make up their mind. That they should show allegiance to either the left or the right. It’s black or white. The problem is that for people in the center, problems are never black or white. Challenges facing Canada and the world today are never black or white, good versus evil. Life is not a comic book. Issues are complex and need to be carefully explored and analyzed in order to find the right solutions. As a guy dead in the center, the thought of being sent to one polar extreme or the other is distressful and completely against my interests. Just because I am not a conservative, I don’t want to be lump in that undefined group called “progressives.” I don’t want anyone to assume that because I don’t share the social conservative agenda of Stephen Harper that I am therefore a lefty. I’m not. I disdain the left as much as the right. The NDPs gameplay to win the next election is to mimic the conservatives. It wants to appeal to the center and appear safe enough for the center to support it. Some have said that the NDP is trying to play the British Labour Party’s game by eclipsing the British Liberals. Some say the NDP is trying to become a policy clone of the Liberal Party of Canada. They are not. Just like the conservatives are trying to expand their support but remain true to their core constituents, so is NDP. As a centrist, if I want to vote for a centrist and moderate party, I can only vote for the Liberals or the Greens. Why would I support a fake centrist party that cares more about its base than my vote? I’m just a commodity to allow them to get power and implement their agenda. Neither the conservatives nor the neo-democrats really care about the concerns of centrists Canadians. Having said that, I will support neither the Liberals nor the Greens for many other reasons. The Liberals are still arrogant and the Greens need to get out from that “progressive” tent they’ve allowed people on the left to lump them into. However, Thomas Mulcair has a lot of work in front of him and if he wants to be the next prime minister of Canada, he will have to bite his tongue often and work very hard. I don’t think he can. He doesn’t have the humility to restrain from attacking existing centrist parties like the Liberals or the Greens. Every swipe he will take at them, as a centrist, I will perceive as an attack against my centrist values. He can’t possibly criticize centrist values and centrist speakers yet seek my vote at the same time. You can’t spit on me and then ask me to vote for you. Unfortunately, the NDP does not have the same sense of reserve and dignity that I expect politicians I vote for to display day in and day out. On political message boards, NDP supporters are as loud and vengeful as conservatives. They have the same bullying quality that I disdain so much. They have the same take no prisoner scorch the earth attitude that pushed me far away from the conservatives. They elected Mulcair because he is an attack dog, not because he is a dignified statesman. Here’s an advice to neo-democrats. In 1993 the conservatives were wiped out of the electoral map with only two MPs left. The Bloc québécois was the Official Opposition ahead of the Reform Party and the NDP. The Bloc was wiped out in the last election and the Reform, merging with the Conservatives have become the new majority party and current government of Canada. Don’t think your status as the Official Opposition means you’ve got it made. Be humble and maybe centrist Canadians will give you a chance.